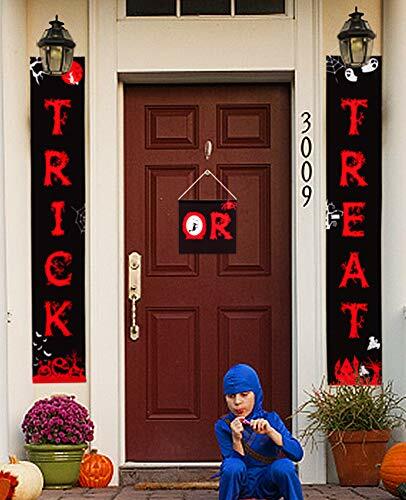 Do you want to add unique touch to your door? 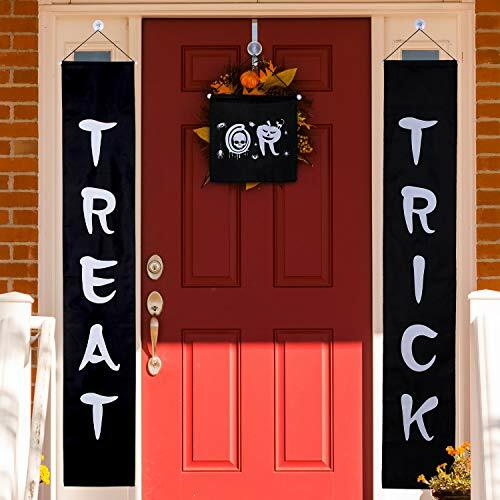 Our Trick Or Treat Halloween Banners are perfect decoration to welcome kids and bring you lots of compliments. 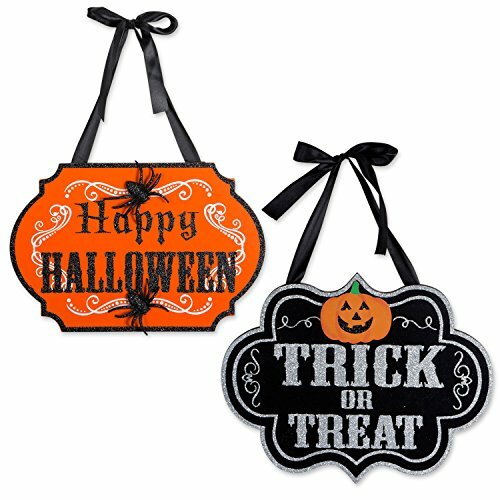 Brief Information Size: "TRICK" and "TREAT" banner - 12 x 71 inch; "OR" banner: 10 x 10 inch Material: Silk pongee material Color: Black&Orange Features Good Quality: Made of silk cloth, not flimsy, easy to air dry in rainy day, durable & reusable, anti-wrinkle for easy to store & carry. Also include rod and string for easy hanging. 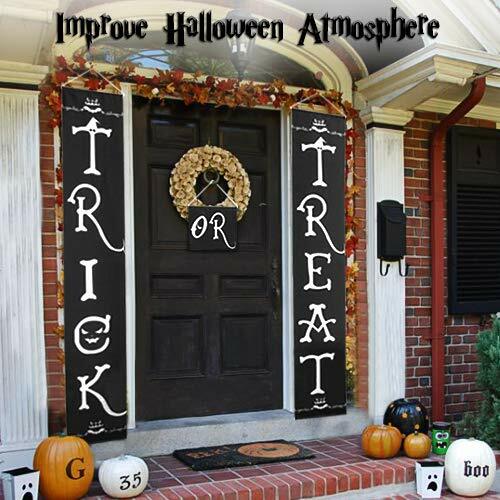 Wide Uses - Hang this Halloween Banner on your house, office, patio, front porch, front door, window and wait for the trick-or-treaters to come, you will receive a lot of compliments on it. Our Guarantee: If you are not completely satisfied with your purchase, we will FULL REFUND guarantee without any questions, if you have any question, please contact us. 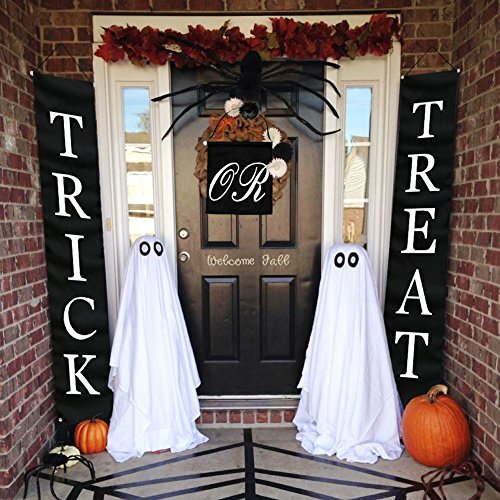 Packing list: 3pcs : 1 x "trick" banner,1 x "treat"banner,1 x "or" banner Color: black with white Size: 72 x 14inch/183 x 35cm Material: shining knitted polyester Weight: 225g Application: Perfect for Halloween, Thanksgiving, Day of The Dead, Christmas, Indoor Outdoor Door Cover Decoration, Window Decorations Note: Wooden sticks and loops make it easier for you to use Hang up little shower curtain weights on the bottom of each to help prevent it from blowing around in the wind Lightly ironed out the packing creases prior to hanging them, banner are large, yet light weight ◆Where There is Amazing Party, There Are Always Starting From OurWarm. ◆We Specialize in Providing Perfect Service for Party, such as Home party, Father's Day, Mother's Day, Graduation, Fall and Thanksgiving. ◆Our Goal is to Warm You With Our Efforts. ◆Share Our Service with You, Share Your Praise with Us. ◆Integrity * Quality * Responsibility * Guarantee. 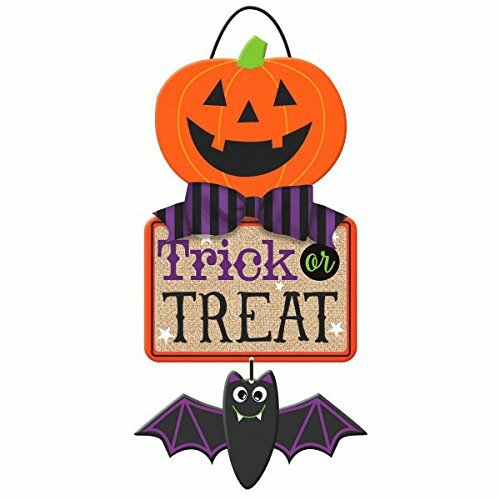 Amscan Specialty Triple Hanging Sign Halloween Trick or Treat Party Decoration, Multicolor, 18" x 9"
Create a spook-taculiar welcome with 18" x 9" Trick or Treat Specialty Triple Sign, perfect way to get away from any trickers. 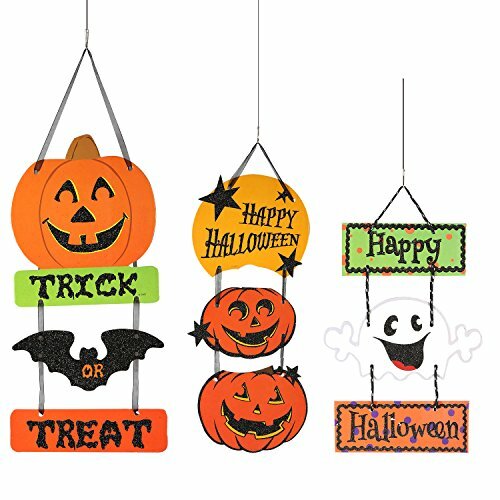 Perfect décor to complete that funny Halloween party or to invite more kiddies for trick or treating fun. 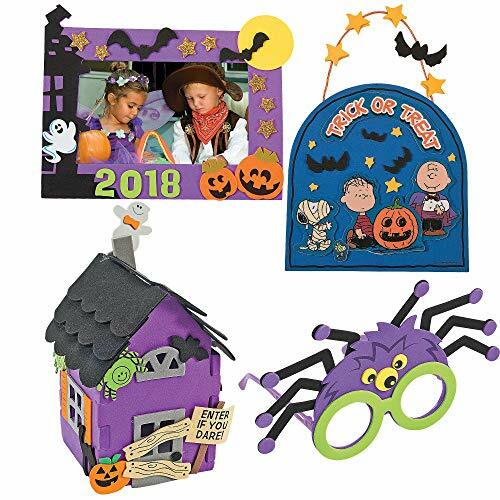 Size: 12" x 11 3/4"3/4\"
Halloween Trick or Treat Fun for Toys Surprise Pretend Play!